As I’ve mentioned numerous times, I reside in the oft-maligned corner of the US called the Southeast. Though it has some distinct advantages (like pimento cheese), the ubiquity of craft brews in the area is sorely lacking. The other brewing regions of the country (as poorly defined by me) all have their strong points. The Northeast has a dizzying variety of breweries from the big name craft brewers of Boston, New York, and Philly…to the clever, Belgian-style ale factories in Northern New England and western New York. The Midwest has a circle of highly regarded brewing cities like Minneapolis, Milwaukee, Grand Rapids, and Munster…all surrounding Chicago, one of the beer meccas of America. The Pacific Northwest is rightly heralded as THE beer-producing region of the US…and Portland, Oregon is often called Beertown, USA. The Southwest has California…which is home to some ridiculously good breweries stretching from Sonoma down to San Diego (and one of the most highly regarded breweries in the country, Russian River). Finally, the up-and-coming Mountain West region hosts Colorado, my pick as a dark horse candidate for best beer state in the country. So where does that leave the poor, picked-on Southeast? Last, of course. As far as beer is concerned, the region is known more for its mass-consumption of mass-production. American pale lagers (or swill, if you will) are the suds of choice in the area. That’s due in part to hilariously backwards alcohol restrictions, the aura of craft beers as something that “elitist Yankees” drink, and the crippling poverty in the area that makes purchasing high-quality (but pricey) brews a luxury most folks put low on their priority list. But things are changing for the better. Thanks to some forward-thinking grassroots organizations, the laws of the land are beginning to change (both Georgia and Alabama recently rid themselves of the puritanical restrictions on the allowable ABV of beers sold in state). That “elitist” mentality is also subsiding and craft brews are seen for what they are…good beer…and not simply a representation of snobbishness. And since the whole country is struggling to make ends meet right now, everyone has started to pick and choose the little luxuries that can help brighten your day without putting a huge dent in your wallet. Craft beers do just that, of course. Still, even with the culture changing, the Southeast lags woefully behind in terms of quality breweries. Because the craft brew movement is so new in the region, it’s really just getting off the ground. When Wifey McHops and I settled into the area a few years ago, I wasn’t expecting much as far as local breweries go. When Free the Hops changed the local laws here in ‘Bama and a flood of good beers hit the shelves of my neighborhood package stores and the taps of my favorite watering holes, I figured I’d be drinking offerings from my favorite breweries in other parts of the country…not here. But a funny thing happened as I deigned to sample the local brews: I discovered the Terrapin Beer Company. Terrapin* was founded, as all good breweries are, by two beer-loving buddies. They were working together at an Atlanta-based microbrewery and decided that they could produce better suds than the other ale factories in the region. 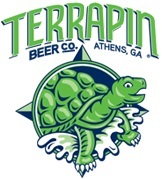 In 2002, Terrapin was born in the college town of Athens, GA…sort of. In actuality, all of Terrapin’s beers were contract brewed (most by the well-regarded Flying Dog brewery in Maryland) at first. It wasn’t until 2007 that the company finally got the financial backing to “truly” open its doors with a 40,000 square-foot brewing operation in Athens. *Surprisingly the brewery’s name has no connection to the University of Maryland or any local, shell-dwelling creatures. One of the founders was a Deadhead…and wanted to name the company after Terrapin Station, one of his favorite Dead tunes. The brewery met with resounding success very early. Their first brew, their flagship Rye Pale Ale was released in the Spring of 2002 and won a Gold Medal at the GABF (in the crowded, hotly contested, American-style Pale Ale category) that year. In 2004, their second beer, a Golden Ale, won Silver at the World Beer Cup. Two for two, and the Terps were just getting started. 2004 also saw the ABV Berlin Wall fall in Georgia which set the stage for local craft brewers to start testing the limits of what their beers could do. The folks at Terrapin were uniquely qualified to take advantage. They started churning out incredibly flavorful extreme beers including an uber-hopped, high-gravity offering called the Rye Squared and a silky smooth Coffee Oatmeal Imperial Stout. The brewery continues to produce new, challenging beers year after year with no sign of slowing down in terms of innovation and quality. It’s safe to say that I’m hooked on Terrapin. Expecting nothing when I moved to the Southeast, I instead discovered one of my all-time favorite American breweries. They can do no wrong in my eyes and I will gladly try anything with their colorful, turtle-themed label on it. In honor of the brewery, I’m churning out a six-pack of tasting notes inspired by a Terrapin-fueled weekend. I’ll post one each day this week. So thanks to the brilliant ale-makers in Athens for providing me with so many wonderful brews since settling in the Southeast. Sure, there’s still a lot of work for us to do to catch up to the rest of the US. But with breweries like Terrapin around, it’s only a matter of time. And for the rest of you brewers going up against the Terps at beer competitions across the country, I’ve got three words for you: Fear the Turtle. Posted in Ale Factories.Tagged Terrapin. You probably know this Brother Barley, Terrapin being your fav local brewery, but at the J. Clyde tonight, they are having a special Terrapin event with Spike the Brewmaster. I’ll be there. So this is my way of giving you a shout out and a wave via the interwebs. I enjoy your articles and the site, and there’s nothing better than the J. Clyde. See you there, even if I don’t know it. Keep up the good work everyone. Thanks for the heads-up, John! I would have loved the chance to drink and chat with Spike…one of the best brewers in the business in my opinion. Alas, while my loyalty to Terrapin is unwavering, my loyalty to the New England Patriots runs much deeper. And since they’re on the road, in a hostile environment on MNF tonight, they clearly need my support more than Spike does. Although, I am drinking Pumpkinfest while I watch so at least I’m giving the Terps a little economic boost during the game. Thanks for reading, my friend. I’m sure I’ll see you at the Clyde very soon. A little update on the Terrapin Takeover, after we consumed many a delicious Terrapin treat, each giving us a raffle ticket and a pint glass (not bad), in the end our group of friends racked up a few prizes, including an all-expenses paid trip to Athens and a tour of the Brewery. I love being rewarded for my alcoholism.